Obi-Wan Kenobi started out as a simple farm boy, before his parents discovered that he seemed to have “unnatural powers”. So they brought him to a Jedi Knight. The Knight realized that Obi-Wan had a strong connection to the Force, and he had a high amount of midi-chlorine’s. Obi-Wan went to the Jedi Temple-where he was a star. He displayed amazing skill and potential, and he graduated at the very top of his class. When the Jedi Knights came, looking for apprentices, Obi-Wan was snapped up by the most prolific one: Master Qui-Gon Jinn. Qui-Gon taught his apprentice well. He nourished and enhanced Obi-Wan’s connection to the Force, and soon a strong bond developed between the two. They became more than apprentice and master-they became friends. Things got hectic, though, when Qui-Gon was assigned to see what was happening in the Trade Federation ship with the Viceroy and his assistant. They threatened the Queen, and the two had to protect her. Meanwhile, the evil Darth Sidious was after the two, and he sent his apprentice Darth Maul to capture and kill the Knights. They rescued Queen Padme Amidala on Naboo, but they were running out of fuel. So they stopped in Tatooine a rocky, desert planet where Hutts, Pod Racing, and slaves were the thing. While there, they met a young boy who would change the entire galaxy-Anakin Skywalker. Anakin was a young slave boy, whose only future seemed to be working his life away for Watto-a Toydarian junk dealer that sold ship parts. But when Qui-Gon saw him, he immediately recognized that Anakin had the strongest potential for the Force of anyone. He could be The Chosen One. The One who would finally destroy the Sith. Anakin won his freedom in a Pod Race, but he had to leave his mother as he went with the Knight, Obi-Wan, and the princess. The spying Darth Maul, a Sith who had potential equal to Obi-Wan’s, caught up to them-but they barely escaped. Obi-Wan then traveled to Corusant with Qui-Gon and the boy where the Jedi Council interviewed Anakin. After Qui-Gon decided to train the boy, they decided to go back to Naboo to take back the city of Theed from the Trade Federation. They fought their way into the Theed Palace until they were intercepted by the evil Darth Maul. Darth Maul was one of the most powerful apprentices the Sith had seen in a long time thanks primarily due to the large amount of time his master-Darth Sidious- had invested in him. He was only an apprentice at this stage and had accessed a fraction of his available power. If things had gone differently, he might have become a Sith Lord nearly equal to Lord Sidious. To make things worse, he wielded a double-bladed lightsaber. The two Jedi engaged the Sith in battle around the Palace, and both sides seemed to be holding their own. Unfortunately the security fields separated Obi-Wan from the other two. When they fought alone, Maul was too good-he distracted Qui-Gon Jinn and stabbed him through the abdomen. Obi-Wan was devastated-and Darth Maul fought him alone. Maul beat on him and knocked him to the edge of a pit. As Obi-Wan clung for dear life at the edge- the Sith apprentice kicked Ob-Wan’s lightsaber into the pit. Obi-Wan was seemingly defenseless but using the force leaped over Maul and commanded his former master’s lightsaber to fly to his hand. By the time Darth Maul realized what was going on, it was too late. Obi-Wan had sliced the Sith in two and watched as both sides plummeted into the abyss. Qui-Gon was barely alive, but his last words were for Obi-Wan to become Anakin’s master. “Train the boy. Train him” Obi-Wan listened as Qui-Gon died. Obi-Wan went back to Anakin and explained what happened. At first Yoda was skeptical- granting him the rank of Jedi Knight but not as the boy’s master. Yoda reluctantly concedes upon learning that Obi-Wan gave Qui-Gon his word to train Anakin. Obi-Wan later solemnly attends the funeral pyre of his master and friend; feeling more comfortable knowing that he fulfilled Qui-Gon’s dying wish. Throughout his time as a Jedi Obi Wan has undergone complete changes in his character, personality and traits, primarily due to his increasing maturity, but also in part due to the grief and sorrow surrounding him. In his first appearance in the Phantom Menace Obi Wan is still a Padawan to the great Jedi Master Qui-Gon Jinn. He is quite similar to Anakin Skywalker when he was a padawan, as they both share traits such as their arrogance, confidence, audacity, tenacity, jealousy and passion. Obi Wan displays his first outward sign of jealousy towards Anakin as he feels as though his master is giving the boy more attention than to himself. Following the death of his master at the end of the first episode, Obi Wan is forced to mature and deal with the grief and anguish thrust upon him, as he loses the only fatherly figure in his life. This is the first and the biggest of the changes that Obi Wan undergoes. His dead master has left him with the last request to train the boy whom he was envious of and against the council’s wishes. This turns him into a far more mature and responsible character as he now has to set an example to his padawan and lead by example, and display all the virtues of a good master in order to do Qui-Gon Jinn proud. Through his development as a master to Anakin he begins to become more embroiled with politics and becomes somewhat of a diplomat, and earning the respect and admiration of many Senators and Rulers. After the fall of his only padawan (Anakin) to the Dark Side Obi Wan experiences his another serious change. He is shaken to the core by the actions of his padawan and their repercussions, and feels as though the execution of Order 66 and the death of the Jedi and the rise of the sith is all his fault. He like Yoda in shame places a self-imposed exile on himself on Tatooine, which will serve a dual purpose of also teaching of his padawan’s son. His solitude and age leads to the waning of his power and he decides to teach Luke and confront Darth Vader before he is too weak. During his short time training Luke he imparts all of the Jedi rules, codes morals and aims and teaches him proper values and the true Jedi ways. It is thanks to the teachings of Obi Wan and Yoda that Luke becomes the Jedi he was born to be and overthrows the Sith an restores the Jedi. In Luke is his greatest success. Anakin got older, and a bond developed between them. They were almost like brothers in fact. It was similar to the bond that had once grown between Obi-Wan and his Master: Qui-Gon Jinn. They went on missions together, and Anakin proved to be invaluable in saving Obi-Wan’s life. However, Anakin also grew reckless and didn’t think before he acted so Obi-Wan often had to keep him in check. Meanwhile, Obi-Wan was growing stronger in his connection to the Force and in his skill as a fighter and lightsaber wielder. He was nearing his prime- so to speak, but still visited Yoda and other high, old Masters for advice. He became a fully-fledged Jedi Knight and a Jedi Master in the Council. However, he soon realized that the Separatists were about to launch a new plot to take down the good system that ruled the universe-so he and Anakin went back into action. Count Dooku (also known as Darth Tyrannus) was another powerful Sith unbeknownst to the Jedi. He had been the student of Yoda who turned away from the Jedi Order and joined the rising force known as the Separatists, and he joined the Separatist movement as the leader. Dooku’s new master was none other then the Dark Lord Sidious himself, who had recovered quickly from the loss of Darth Maul- now sporting a new apprentice to do his bidding. Obi-Wan and Anakin kept their tight bond, but Anakin had problems with the Dark Side-which you will read about later. Obi-Wan saw that new soldiers were being “recruited” for the Republic- clones of the renowned Mandalorian bounty hunter: Jango Fett from the planet Kamino. This bounty hunter, Obi wan guessed, was one who planned the assassination on the former queen of Naboo; Senator Amidala. Fett and Obi-Wan battled soon after meeting each other on Kamino. They fought a ferocious battle in which Obi-Wan was also fired upon by Jango’s son Boba. Fett’s skill and weapons were not enough to kill the Jedi and he attempted to escape, however, Obi-Wan threw a tracking device onto the hull of Jango’s ship-the Slave I. After realizing the Jedi was still on his tail. Jango and Obi wan engaged in an intense space battle through an asteroid field. Jango had shown that he was winning very early in the fight. Obi-Wan was under constant fire and Jango had many tricks up his sleeve such as the explosive charges that he ejected from his ship. Jango soon decided to end the fight an fired two homing missiles at Obi-Wan’s ship. Luckily, Obi-Wan ejected projectiles from his ship just in time to intercept them; making it look like he had been hit and deceiving the bounty hunter. This is one of the finest displays of Obi-Wan’s flying abilities and is a real testament to his character as he achieved this feat despite constantly bemoaning about how he “hates flying”. Obi-Wan followed the Slave I to Geonosis were many Separatist ships had gathered. He soon spotted Count Dooku and several Separatist leaders. He quickly sent the Council a report on the situation but was taken hostage by the Separatists. Count Dooku met him in his holding chamber and asked hm why he was there. Obi told him most of his story cautiously while Count Dooku told him that a “Sith Lord named Darth Sidious” was in control of the Republic. This statement would prove to have an unexpected and terrible truth to it later on. Unfortunately Obi-Wan was brought to an arena where he was put in a horrific position; tied to a pole where he was met by his apprentice, Anakin, and Padme who had disobeyed orders to try and and help him. They were trapped as a Nexu a Reek and an acklay came out to eat them in the gladiator style arena. With the skill of the two Jedi and surprisingly battle ready Padame, they were able to free themselves and fight off the arena monsters. Numerous soldiers, clones, Jedi Knights, and droids busted in-and a full-scale war let loose. Mace Windu was among the Jedi there, and Count Dooku was at the battle. Many Jedi died that day, but they won. Obi-Wan and Anakin escaped back into a temple-where they found Count Dooku waiting for them. It was during this confrontation where Jango Fett who skirmished with Obi-Wan earlier ultimately met his demise. Following this, Obi-Wan and Anakin caught sight of Dooku fleeing on a speeder. In the ensuing pursuit Padme and a few clones fell off. Anakin demanded the ship turn around, however Obi-Wan reasoned with his student and they continued. Upon reaching the hangar, Obi-Wan warned Anakin not to be too headstrong. Anakin ignored this and was nearly killed with a blast of Force Lightning from Count Dooku. Obi-Wan had met his match with Dooku who had just overpowered Obi-Wan and Anakin when Grand Master Yoda appeared to save the Jedi. Throughout this period of time, though, Obi-Wan’s apprentice Anakin was getting closer to the Dark Side. He cared deeply about those he loved-and he feared losing them so much that it put him on the path to the Dark Side. The most obvious example being Padme whom he married in secret and who was the cause of much fear and anxiety for Anakin which Obi-Wan unfortunately didn’t realise fast enough.. While Obi-Wan was at the cloning factory and fighting the bounty hunter Jango Fett, Anakin had gone on an independent mission to see Tatooine for he wanted to see his mother. When he arrived at his home he was informed his mother had been kidnapped. Sand People had savagely beaten her-she was near death. She died in her son’s arms. Anakin flipped, so to speak. In a blind rage, he murdered the entire Sand People: tribe-men, women, and children. Obi-Wan felt this disturbance in the Force with Anakin, and he tried to control it, however did not entirely succeed. Near the end of the Clone Wars, Obi-Wan and Anakin went on a mission to find General Grievous- the new leader of the Separatist movement and Emperor’s apprentice. He had taken Chancellor Palpatine (a high-ranking politician who was secretly the Emperor) hostage. While there, they found their old nemesis-Count Dooku. They fought Dooku, and he knocked out Obi-Wan. Anakin fought him savagely, and got him in a death pose. At Palpatine’s urging; he killed his nemesis. Anakin fostered a friendship with Palpatine, while talking to the Jedi Council. They allowed him a place on the Jedi Council-but did not grant him the rank of Master. Anakin was livid, and nothing Obi-Wan did could cool him down. Eventually, Anakin got on the path to the Dark Side, as the Chancellor told him that Sith could bring people back to life. Anakin then found out that Palpatine was a Sith Lord, Darth Sidious. He alerted Mace Windu, and the Jedi Master defeated Palpatine after a grueling battle. But at the last second, Anakin’s allegiance to Emperor and ties to the Dark Side won. He severed Mace Windu’s sword arm and with it, his ties to the Jedi Order. Giving himself to the Dark Side of the Force, he became Darth Vader. During this time Obi-Wan had been dispatched to Utapau to find and kill General Grievous, and disrupt the Separitist movement. After a tough battle, Obi-Wan in a similar situation to his fight against Darth Maul, used the force to summon Grievous’ pistol and shot him dead with it. This is considered one of his greatest triumphs. He was here when Order 66 came in, and narrowly escaped with his life. Obi-Wan simply noticed that Anakin was growing darker. But he saw tapes of Darth Vader helping Palpatine and being on the Dark Side-killing younglings in the Jedi Temple. Vader traveled to Mustafar-and Obi-Wan was sent there. 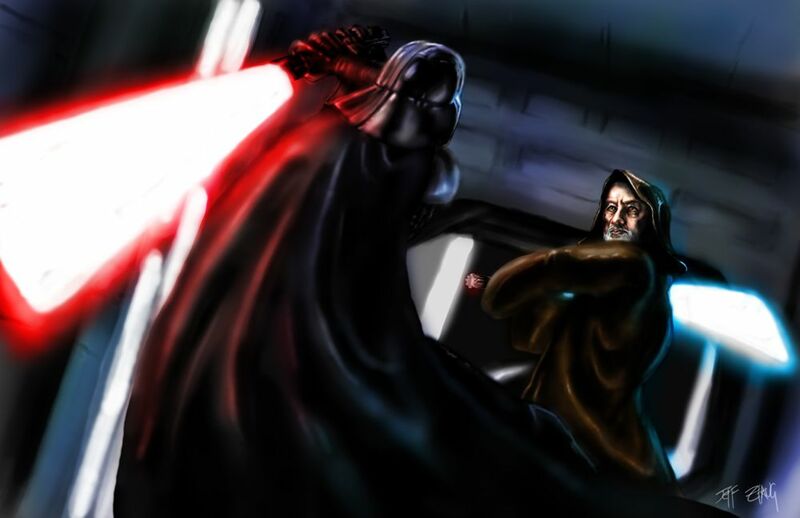 Vader attacked Obi-Wan-but in a huge battle, but Obi-Wan defeated him and severed his left arm and legs. Had he not severely wounded his former padawan like he did, the galaxy would have had to face a much more powerful Vader in the future. Vader nearly burned to death there, but Obi-Wan let him live however not before taking his lightsaber. He was found by Palpatine, who encased him in a black obsidian-based suit. Obi-Wan went back with Padme, who was now Anakin’s pregnant wife. She had two babies; Luke and Leia. She then died in childbirth, so Obi-Wan delivered Luke to Anakin’s stepbrother Owen Lars and his wife, who were farmers in the Tatooine desert. There Obi-Wan stayed-growing stronger in the Force while growing old. He lived alone, as Ben Kenobi on Tatooine- an old man. This lasted for over twenty years…until our story of Obi-Wan picks up again. Obi-Wan lived in solitude as Ben Kenobi in Tatooine for so long. But suddenly, he felt a great change in the Force-like something was about to happen, and he heard the Sand People making a disturbance outside. When he went out, he found a young teen, Luke Skywalker, being attacked by Sand People. He drove them off, and went with the boy back to his house. However, when he got there, storm troopers had destroyed Luke’s home and killed his uncle and aunt, who had raised him. Luke was devastated-but he decided to go with Ben to avenge his foster parents and father and fulfill his role as a Jedi. They went into a bar, and Ben demonstrated his power as a Jedi-he cut off the hand of an unruly patron. There they met Han Solo a renegade pilot who needed money and had many people after him. Ben explained to Luke that he could be a Jedi like him-and that he needed to be the hero to bring down the Empire. The evil Empire ruled the galaxy, and it’s leader Darth Vader was the evil tyrant who led it. And Ben told Luke, that Vader killed his father. The four left, and they found the Death Star in space-a huge space station the size of a small planet. It could obliterate planets-and it killed Leia’s home planet, Alderaan. The Death Star pulled the Millennium Falcon in using a tractor beam , and they escaped from the storm troopers. They split up. Ben went alone to disable the tractor beams and shields-while the other three went to find away to destroy the Death Star or escape and rescue Leia. While they were escaping, Ben had shut down the shields, where he ran into none other than Anakin Skywalker, his old apprentice who later became Darth Vader, the apprentice of the Emperor. They fought evenly, and they had both grown in skill since their ferocious fight on Mustafar. As they fought, Luke suddenly found them fighting. Obi-Wan Kenobi wanted Luke to hate evil and push him away from the Dark Side. So he set down his lightsaber and became one with the force momentarily before Darth attacked him. Obi-Wan Kenobi was dead. He had sacrificed his life to save Luke from evil, and Luke was devastated. Vader, confident, strode off, and Luke escaped-while filled with anger. Kenobi was successful-Luke was now repelled by the Dark Side and the Empire. And Darth Vader, who he would later learn was his father. But Obi-Wan was a powerful Jedi, and he possessed the most powerful ability-his spirit could live on when his body was dead. He became what is known as a Force ghost. And so the story of Obi-Wan Kenobi did not end with his death-it merely marked a new chapter in his life. After his death and rebirth, Obi-Wan did not appear nearly so much as he had in life. The first time he showed himself beyond the grave was when Luke was flying his ship through the tunnel of the Death Star. Luke needed to shoot two bombs directly into two holes in the Death Star. The holes would lead down to the core of the Death Star, and the bombs would explode it, destroying the entire Death Star. Luke had his aiming mechanism on, but he missed twice. He then heard Ben Kenobi’s distinct voice in his ear, telling him “Use the Force, Luke.” He put down the aiming mechanism and used the Force-and the bombs went in. He didn’t hear or see Kenobi’s spirit again until later. After that, Luke and the other Rebels were holed up in a base on the ice planet Hoth. He was stranded on the ice, having fended off a wampa and Kenobi appeared to him as a ghost, and told him how to survive, and helped him use the Force to fight off a creature that was attacking him. He then told Luke to go to the swamp planet Dagobah, where a great Jedi Master lived. He told him that the Master’s name was Yoda, and he was the Grand Master of the jedi. Luke went to Dagobah and found Yoda-and Yoda’s training was instrumental in Luke eventually bringing down the Empire. After that, Kenobi would appear to Luke in times of need, or when he needed help. He tried to discourage Luke from traveling to Cloud City to fight Vader, to bring Han and Leia back. Kenobi appears on Dagobah to explain to a heartbroken Luke why he did not tell him the truth about his father, and to confess that Leia was his sister. Kenobi admits that his own pride had been partly to blame for Anakin Skywalker’s fall from grace: “I thought I could instruct him just as well as Yoda. I was wrong.” He then tries to explain to Luke that killing Vader is the only way to destroy the Empire and save the galaxy- even if it meant killing his own father. This, however, did not come to pass. Instead of Luke killing his father-Darth Vader decided to become Anakin once more and sacrifice himself, fulfilling his destiny. Obi-Wan had not failed Anakin after all. Obi-Wan Kenobi was a well respected and eloquent diplomat, a wise teacher, a good swordsman, an influential general, and a powerful Jedi. Previous PostPrevious Top 10 Most Powerful Superheroes and Villains!